4* apartment, 5 minutes walk to beach, private garden, parking, beautiful views. 'Castle View', 5 Malin Court has been awarded a 4* from Visit Wales for its high standard interior. It is a 5 minute stroll down the hill to the sandy beach, seaside village and picturesque harbour of Saundersfoot. It is opposite the famous St Bride's Hotel. It is a spacious ground floor apartment with 2 bedrooms and one bathroom, lounge and dining area, fully equipped kitchen and picture windows. The property offers a private garden area beautifully maintained, ideal for breakfast or an evening glass of wine with glimpses of the sea and town. It also has free parking for one car and a few hours additional guest parking for another car. The quaint harbour village of Saundersfoot has a spread of lovely shops, bars and restaurants, and is an ideal base for walking the coastal path. Head east through the old tunnels to the rugged coast at Wiseman's Bridge and onto the open sands of Amroth, or head West, an 8 minute drive to Tenby. Saundersfoot is within easy reach of local theme parks and family attractions like Oakwood and Folly Farm. Lounge/dining: Smart TV, DVD player. Kitchen: electric cooker, fridge/freezer, microwave, washing machine. Bedroom 1: with double bed and fitted wardrobes. Bedroom 2: a single bed and trundle bed. External: private garden and patio area. Parking for 1 car (and a few hours for a guest car). Rent inclusive of electricity and electric heating. Duvets, linen and towels provided. Cot & highchair available. After my Aunt passed away, we wondered what to do with the legacy she left us. She always loved her holidays by the sea and so we decided to buy something she would have enjoyed. This is a wonderful, private apartment by the sea. We don't have to use the car all week if we don't want to. We can walk, rest, enjoy the local restaurants, swim in the sea and sail all within striking distance of Cardiff where we live. We hope you enjoy it too! Storage Heaters x2 in the lounge. Small heaters in each bedroom. Heater and electric radiator in bathroom. Free parking for the time of your stay plus another space for a few hours parking for a guest. Very nice flat. Excellent location. Everything we needed was in the flat. Excellent parking. Slight hiccup with new heating system but Jenny was straight on it BUT, noise from upstairs was terrible. Shouting and floorboard noise until 1am and children running around and shouting from 5am. For this reason only we would not stay again. Sorry Jenny. A nice, well appointed 2 bedroom apartment in a nice spot in Saundersfoot. Unfortunately noise from the apartment above seems to be an ongoing problem. 3 nights of almost constant overnight movement in the flat above spoilt for us what otherwise would have been an excellent long weekend. Our main issue is the fact that the owner knows there is a problem, but only a knowledges it after a booking has been made. Really enjoyed our short break in this apartment, it was roomy, well equipped and had a friendly homely feel. The only negative was the noise from the apartment above, we were out all day but in the evenings as your settling down the noise from upstairs was unsettling. But apart from that It was perfect. Thank you for your lovely comments. So glad you found it comfortable and a good base. A comfortable apartment in an excellent position to explore local beaches and places of interest. Highly recommended. Thank you for your review. We are so glad that it suited and you had a lovely time. Hope to see you again another day. 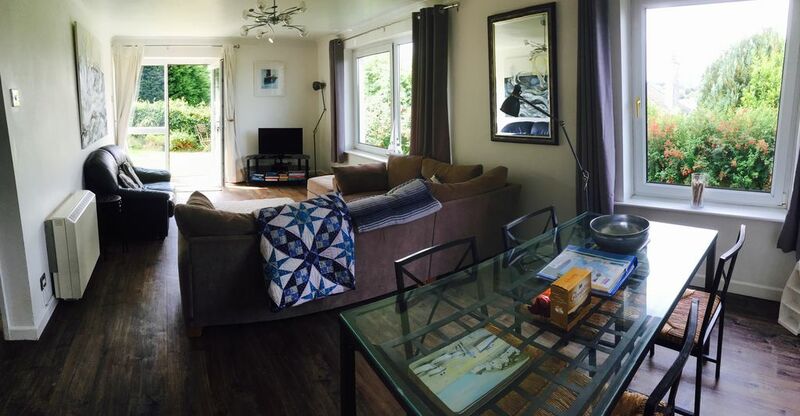 Lovely comfortable apartment in Saundersfoot. A walk down a big steep hill to the beautiful beach and town. Lovely fish and chips and swim. Only problem is quite noisy from flat above. Can hear their TV and when they walk the floorboards are so noisy. The flat itself has everything you need. Tenby is so close and lovely boat trip to Caldey Island. Take bug spray though as we all got bitten to death!! We had a wonderful time. We couldn't have asked for better weather and wherever we went we were welcomed. We ate very well and too often! We will definitely come to this area again and we can tell our family who are coming to the area later in the year, the best places to visit. So glad you both had a good time Judy. Thank you for your positive review. Come back to the area again soon!